Following her Betty Boop-infused exhibit at the Galerie Pierre-Alain Challier, and her oils peopled with women coiffed with a tarboosh (a traditional masculine accessory, also known as a fez) at the Saatchi Gallery, Lebanese painter Mouna Rebeiz reinterprets two Connaissance des Arts covers. In September of 2015, she reworked the ﬁrst cover, reproducing a detail of the portrait of “Eleanor of Toledo” by Bronzino (1522), only conserving the original crop and the ﬂat red tint that underlined the titles. In Sep‐ tember of this year, she repeated the exercise with the cover of our fall issue, featuring the self-portrait of the young Rembrandt (1629). Our logo and the article titles have disappeared. 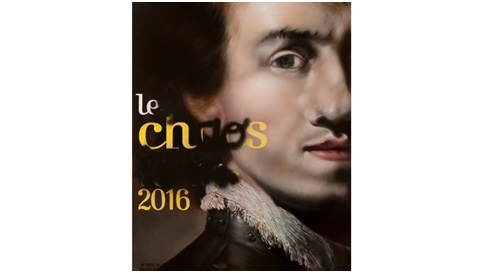 She graﬃtied the headline, “Les chocs de la rentrée 2016” (The Shocks of the 2016 -2017 Season), revealing the word “chaos”. Part provocation and part determination to erase the limitations of words, it is a very personal interpretation of the Connaissance des Arts cover. All that remains of the original is the bar code and the sen‐ suous touch of the Dutch master, which she learned at the atelier of Alix de la Source, a specialist of 17th century painting. Mou‐ na Rebeiz thus combines ﬂawless, Old Master technique and her commitment to defending the meaning of works of art. At the end of January 2017, she will present her abstract oils inspired by the opera and a series of pastels at the Galerie Pierre-Alain Challier. Other facets of her patient and engaged art.